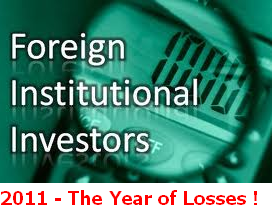 FIIs Big losers in 2011 - Story of 'hot money' going cold ! 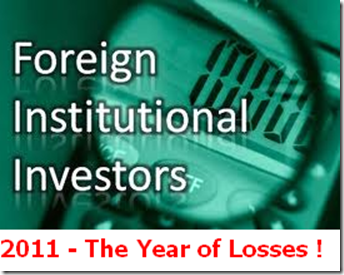 FIIs Big losers in 2011 – Story of ‘hot money’ going cold ! ‘Market is supreme in itself’ – this cache reaffirms my faith in the functioning of the equity markets that no one can manipulate it by way of its size and quantum of funds. If this is too generalized a statement for you to digest, it must suffice to convince you that even the FIIs, the so-called ‘hot money’, went cold in the year 2011 in terms of returns on their equity investments. You heard it right – foreign investors are estimated to have lost a whopping Rs.2 lakh crore during last calendar year on their investments in the emerging Indian markets, as per a media report. That’s a staggering piece of statistical data, isn’t it? Usually, a general perception is that FIIs brings in lots of money in a short span of time, prop up stocks, jack up markets and sell at profits (and make markets crash) before fleeing to other lucrative investment destinations. Thus, almost every body agrees that they are the bad boys of the world of finance. FDI inflows are more reliable source of long-term funds. However, there’s other side to the story as well – for which we need to look at Indian markets in 2011 from FII’s point of view; and you could soon realize that there is no godfather where money and emotions work in synch with each other. In fact, the quantum of losses suffered by FIIs ballooned to $380 million worth of Indian shares with benchmark indices slumping by 25% in 2011 to log its first annual fall in 3 years; as sky-high inflation, high interest rates and slowing growth took a toll. Firstly, FIIs poured in money when Indian markets were testing waters of its last bull market peaks (roughly between Sensex 18 -21k), at a time when Rupee value was stable in a broad range of 42-45 against a dollar. Later on, the sovereign debt crisis in the Euro zone has worked wonders for the bear cartel to tighten the snooze on big money. As soon as the foreigners realized that this could well be a long-drawn bear market in the making, they started shifting to safe haven investment destinations. By then, the Indian markets had almost corrected by 15-20%; dragging down along with it the rupee value by almost a fifth to stare at a record low of 52 per dollar..
By now, it was a no brainer to conclude that FII’s could have well lost almost a third of its investment value in India, stung by a steep appreciation in the dollar index and global crisis situation. Thus, this time around, it’s not only the domestic retail and DIIs who incurred losses, but FIIs as well. In fact, DIIs in my view wouldn’t be big losers this year. My justification for the same being – domestic institutions sold when FIIs were buying, and they are buying when FIIs are selling. Also, there was no erosion on account of currency fluctuation for domestic players. The worst faring part in the flock is inevitably FIIs. So, will FIIs recoup their losses in 2012? or will apprehension continue to overwhelm the investment sentiment in the new year? Wishing a Happy & Rocking 2012 to all of you! What to look forward to on trak.in in 2012! Now Get Live Stock Updates on Twitter From BSE! In a Surprising Move, Nikesh Arora Resigns from Softbank! Oracle to Invest $400M in India, New Campus & 9 Incubation Centres Coming Up!